Conveniently located near the Joinville-le-Pont RER station, the Hipotel Paris Hippodrome offers quick and easy access to Paris. It features comfortable and good value accommodation. The rooms at the Hipotel are homey and fitted with all the facilities you will need including tea and coffee making facilities. The generous buffet breakfast is served daily in the dining room, and the restaurant proposes buffet-style traditional French cuisine. You will receive a warm welcome at your arrival and a welcome tray in you room. Our hotel Hipotel Paris Hippodrome is situated at Joinville-le-Pont, next to Marne and just 15 minutes from the centre of Paris. We are well situated for access to both Paris and Disney Land Paris. Our restaurant offers a range of buffets. We offer you a choice of a calm environment in regard to the Hippodrome de Vicenne, parks and forest, as well as the city life of Joinville-le-Pont. Paris (10 kilometres) - City and capital of France, located in the North-central part of the country. The city was founded more than 2,000 years ago on an island in the Seine River, some 233 miles upstream from the river's mouth on the English Channel. Disneyland Resort Paris (20 kilometres) - Two theme parks: Disneyland Park and Walt Disney Studios. Disneyland Park has over 40 fantastic rides, which are among the finest in the world. The newest park is the Walt Disney Studios with attractions like 'Rock 'n' Roller Coaster' and many more. From A4 (Paris/Province): Exit Junction Joinville then follow Champigny sur Marne directions. From A4 (Province/Paris) and A86: Exit Junction Nogent sur Marne/Champigny. Follow the directions for La Fourchette de Champigny then Joinville. Nearest Motorway or Main Road - A4. Junction - Joinville-le-Pont - 0.5 kilometres. Airport - Orly - Paris-Orly - 14 kilometres. Airport - Roissy - Paris-Charles De Gaulle - 24 kilometres. Nearest Major Train Station - RER - 0.5 kilometres. 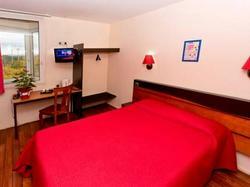 Nearest Local Train Station - Joinville-le-Pont - 0.1 kilometres. This room features a satellite TV, a telephone and a private bathroom with a bath or a shower. This double room has a satellite TV, electric kettle and view.